Christopher Daniels shocked the world Friday night at Ring of Honor’s 15th Anniversary show, finally winning his first World Heavyweight Championship 15 years after debuting for the company. Daniels wrestled in the main event for the very first Ring of Honor show, and is considered one of the most greatest wrestlers in the company’s history. His victory was an almost cathartic experience for any longtime fan of the man who was at one time universally considered the best wrestler on the independent scene, but who never seemed to get the same acclaim or opportunities of some of his peers, or in many cases, the people he helped inspire. The longtime TNA and ROH stalwart had countless good matches. But if you’re unfamiliar with Daniels’ body of work and want to dive into his library, here are five of the greatest matches in the career of the Fallen Angel. This was the end of a long term feud between the team of Triple X—Christopher Daniels and Elix Skipper—and America’s Most Wanted, made up of James Storm and Chris Harris. The stipulation was that the losing team had to disband, meaning that the stakes couldn’t be higher. And the two teams delivered what was inarguably TNA’s best match of 2004: A 20-minute bloody battle between the two best tag teams in the company. The match starts out as a traditional tag, not a tornado, which doesn’t make a whole lot of sense. If the match is otherwise no-DQ, why bother tagging? Eventually this conceit is forgotten, and that’s where the action really amps up. Elix Skipper reveals a pair of hidden handcuffs and chains Chris Harris to the cage, and Daniels and Skipper proceed to pick Storm apart. Daniels, in brilliant heel fashion, flashes the key in front of Harris’ face before hanging it around his neck, an obvious example of Chekhov’s Gun if ever there was one. After using the key as a brutal weapon, Daniels gets speared and drops it to the ground. Harris is, of course, freed. Blood starts pouring out of almost everyone’s face—so much so that the announce team starts to mix up Harris and Storm in the process. This all leads to the match’s most memorable spot: Elix Skipper tightrope-walking the top of the cage and delivering a jaw-dropping hurricanrana, which is followed by an elbow drop off the top of the cage by Daniels. Eventually, Daniels is locked to the cage himself—comeuppance!—and AMW wins, ending one of the best feuds in TNA history. 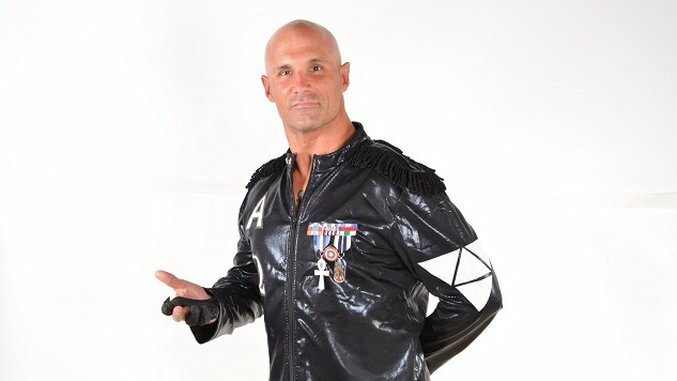 It’s worth remembering that, when Ring of Honor debuted in 2002, Christopher Daniels had already been wrestling for almost 10 years. So when this upstart company needed a main event for its first-ever show, they chose this “King of the Indies” to face off against two wrestlers who’d just started making waves on the independent scene, Low Ki and Bryan Danielson. The “Fallen Angel” gimmick was in full effect in those early ROH days, with Daniels coming out in priest attire to Marilyn Manson’s “The Beautiful People.” Going forward, his Prophecy stable was one of the more interesting things going on in the company, but on this night, it was all about the wrestling: 20 minutes of back-and-forth between the men who would go on to be known as Ring of Honor’s founding fathers. Daniels is, if not at his prime, then damn near it, and while Low Ki and Danielson are still trying to make a name for themselves, they really bring it here. It’s impossible to know just how much Daniels’ veteran instincts brought to this match and this locker room, but I’m willing to bet Ring of Honor has a much shakier time getting on its feet without Daniels’ in-ring expertise. As it stands, this math blows everything else on the card out of the water, and remains one of the best ROH matches in history. It also marks the beginning of a proud Christopher Daniels tradition: Refusing to adhere to the “Code of Honor” handshake before and after the match. The still above is from their Bound for Glory rematch, which was also strong. But for a few reasons, their match at Against All Odds was the superior bout. At the start of this match, announcers Mike Tenay and Don West sell the fact that this is the first encounter between Daniels and Styles in TNA, and that Daniels “put Styles on the wrestling map” at the NWA 53rd Anniversary show. Without question, Styles and Daniels have at times had dovetailing careers, and this match is one of the most impressive in their oeuvre. The story of the match is Daniels working Styles’ ribs, with strong commentary from Tenay and West to help advance the narrative. When, nearing the halfway point, Styles tries to hit a 450 splash, Daniels brings up his knees, and Styles lands hard. An Angel’s Wings later, and Daniels gets the first fall. That’s when Daniels goes into full heel mode: Killing time, pointing at his wrist like it’s a watch, yelling “scoreboard!” But after nine minutes of desperation, near fall after near fall, Styles somehow ties it. Now Daniels is the one frantic, busting Styles open against the steel ring post, pounding his bloody forehead. With less than a minute left, Daniels locks in the koji clutch, but with blood dripping down his face and onto Daniels’ leg, Styles passes out and the match goes to a time limit draw. For a moment it feels like disappointment, before Daniels demands the match continue. A cameo from one “commissioner” Dusty Rhodes later, and the match is restarted, but to the chagrin of the cocky, overconfident heel, Styles somehow pulls it out in uniquely Styles fashion, and retains the X Division Championship. The Fallen Angel couldn’t get it done, but much like that NWA anniversary show, he made Styles look great in the meantime. This was the match that started Daniels’ march toward the title. “How tight do you think your grip becomes,” Daniels asked in a now-infamous promo, “when you believe that, if you let something go, you’ll never hold it again?” Leading up to this match, the story was that Daniels was in the twilight years of a 20-plus-year career, and desperately needed to be successful, because if not, then what has his life become? That “at any cost” attitude carried over into this Ladder War, a spectacle that will go down as one of the greatest ladder matches of all time. It was the perfect confluence of four great opponents—there are some spots by the Young Bucks in particular that defy logic—alongside Daniels’ incredible ability to tell a story and his desire to put his body on the line for a great match. Somehow, the 45-year-old Daniels was able to take the brunt of the damage, getting busted open by a ladder shot early, and later, getting powerbombed onto a ladder before being hit by a high-angle senton bomb by Nick Jackson. Later, a Young Bucks “superkick party” sent Daniels onto a stacked barricade on the floor, and then toppling off. It was mayhem, and Daniels was at the very center. That’s not to say he was the only one taking risks: In arguably the most memorable spot, the Addiction and Motor City Machine Guns lifted a ladder into the air and dumped the man climbing it, Nick Jackson, through a table on the outside. It was a car crash, in the absolute best way possible. In the end, the Bucks took the titles from the champions the Addiction. But it was the start of Daniels’ babyface turn, the legend at the end of his rope. And when, last week, he finally won the Ring of Honor World Championship, is was made all the more satisfying. Here’s the surprising thing about this list: Christopher Daniels doesn’t win even one of the matches. The reality is, Daniels was always a great wrestler, and at his best, he was helping make other people look good. That’s part and parcel with being a great heel, something Daniels has been for a good chunk of his career. Here is no different: Daniels, who at six months was the longest-reigning X Division Champion in company history at the time, had just screwed AJ Styles out of a No. 1 contender spot against the undefeated Samoa Joe. As penance, the title match was made a triple threat, and what followed was without question the greatest match in TNA history. The secret to this match’s greatness is making sure the best sequences included all three men: In one instance, Daniels hits a seated springboard moonsault to Samoa Joe on the outside. While they go blow for blow, Styles hits a springboard shooting star press to take them both out. In another great moment, Daniels hits a monkey flip on Styles out of the corner, and Styles instead turns it into a hurricanrana on Samoa Joe. When Daniels pushes Samoa Joe into one of the six corners for an O’Connor Roll pinning combination, Joe turns it into a rear naked choke, and Styles lands a spiral tap onto both men to break up the submission. And after each and every sequence, they let the moment breath, allowing the fans to, in turn, appreciate what they’re seeing. It’s remarkable, now, to think of TNA’s deep talent pool at the time. Meanwhile, Sting has more TNA world title reigns than these three men combined. Rather than offer up a legitimate alternative to WWE, TNA spent years trying to imitate its product. The result: Propping up ex-WWE and WCW talent while underutilizing younger, legitimately top tier talent. In fact, TNA has exactly one Wrestling Observer-rated five star match, and it’s this one. It’s easy to see why: There were few, if any, mistakes, and all three wrestlers were at a moment in their careers in which they were hungry to prove they were the best. And they were. In the end, it took a missed spear by Samoa Joe and a reversal on Daniels’ Angel’s Wings for AJ Styles to walk out X Division Champion. It was historic moment for Styles, the first man to ever win the X Division title five times. But the reality is, on this night, all three men inside that ring made history.